For trumpet cornet. It is a set of personal studio STX with Brass Resonance Modeling that realizes lightweight, miniaturized pickup mute and comfortable sounding. 【Size / weight】 Pickup mute: 82 × 139 mm · 70 g, Personal studio: 70 × 20 × 98 mm · 69 g (battery not included). Rod has two hardened balls (magnetic) with perfect radius to repair bad dents on tubes. help yourself and help your friends. fast & easy work with dents. 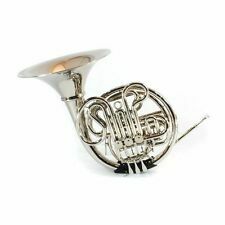 This horn was made by Couesnon & Cie and is a Bb model cornet. Couesnon started in 1827 in France and was known for their high quality brass line. In 1911 they had 8 plants and were the leading producer in the world. 2 Parduba Double Cup #5 & #5 1/2 Star Trumpet Mouthpieces. The brass 5 1/2 has been slightly bent. 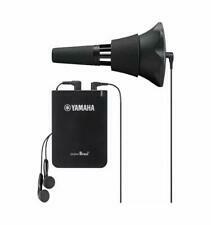 Nice bright sound. One Silver #5 & one raw Brass #5 1/2. 1 Set Trumpet Repairing Parts. Jewelry Findings |Health & Beauty |Wedding Decoration |Sports and Outdoors |Jewelry & Watches |Clothing, Shoes, Accessories |Other. 1 pezzo di tromba. - Suono più forte e potere penetrante più forte. - Lucidatura superficiale, processo di saldatura ad alta temperatura. 32,5 x 11,5 cm / 12,79 x 4,52 pollici. Professional mouthpiece puller, adjustable sitting at the end, whether you are a professional. 1 x Mouthpiece Puller. - Teachers or students are prepared with much-needed tool. You are looking at a bottle of Virtuosi Premium Valve Oil. This low viscosity high grade valve oil features. Very Good Rust and Corrosion Protection Improves valve life. Improves oil life. Cleaning kit for trumpet, make cleaning and maintenance work much easier. Due to the difference between different monitors, the picture may not reflect the actual color of the item. 1 x Extension brush. Marching Baritone. Baritone horn. French horn. Piston: Monel. Surface: Silver nickel. Beautiful Silver nickel surface, perfect intonation, high grade quality. Material: High Grade Yellow Brass. Accessories: silver plating mouthpiece. Marching Baritone. Baritone horn. Accessories: silver plating mouthpiece. Zipper hard case.cleaning cloth, white gloves, etc. French horn. Surface: Clear lacquer. Material: High Grade Rosebrass. Item must be in original condition. ◾Surface: Electrophoresis gold. ◾Smooth Monel valves. ◾Beautiful Electrophoresis gold surface, perfect intonation, high quality. Baritone Horn. French Horn. Wagner Horn. ◾Material: High Grade Yellow Brass,Cupronickel Tuning Pipe. Free Silver plated Mouthpiece. Material:High grade Rose brass, Curpronickel Tuning Pipe. Surface: Rose Brass. 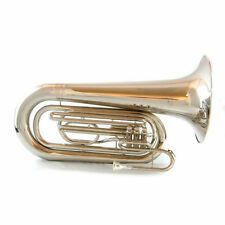 Beautiful Rose Brass surface, perfect intonation, professional quality. Free Professional hard case. Tromba 1 pezzo in Sib. - Materiale: ottone. - Viene fornito con boccaglio, panno per la pulizia, cinturino, guanti e custodia. Custodia da 1 pezzo. - Chiave di Bb, comune per lo studente, la banda musicale e la banda musicale. Tuning Slide: Cupronickel. Marching Baritone. Baritone horn. Zipper hard case.cleaning cloth, white gloves, etc. French horn. Surface: Gold Lacquer. Material: High Grade Yellow Brass. Easy to type,smoothly to play. Circa 1960's. Normal wear for the age. 7 3/8" x 4 1/8". Material: cupronickel tuningpipe. Beautiful Trumpet Horn with hard case, has a very excellent sound. Surface : gold lacquer. Free : silver plated mouthpiece, black zipper case with cleaning cloth, white gloves, case strap, etc. Includes Deluxe Case. With their hands on approach. Material: cupronickel tuningpipe.Rose Brass bell leadpipe. Beautiful Trumpet Horn with hard case, has a very excellent sound. Free : silver plated mouthpiece, black zipper case with cleaning cloth, white gloves, case strap, etc. Drums & Percussion. Leadpipe: Brass. Body material: Brass. Thumb saddle at1st valve slide. Adjustable finger ring on 3rd valve slide. Record Players. 2 water keys. Universal case, compact lightweight, will fit most manufacturer's cornets. Used trumpet, though still in very good condition. 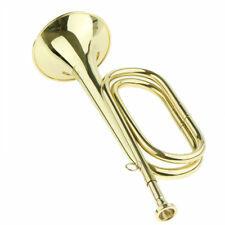 Polished brass trumpet, golden in color. Comes with carrying case, 1 and a half bottle of Blue Juice valve oil and a stick of cork and tuning grease. Well cared for. Great for beginners who are just starting out with an instrument. Acceptable for school use. Baritone Horn. ◾Smoothly action Monel Valves, type in tune with a good marching. French Horn. Wagner Horn. ◾Surface: Silver Nickel. ◾Beautiful Silver Nickel surface, perfect intonation, high grade quality. Gouttière / Réservoir pour Euphonium Tropfenfänger für Euphonium. Valves Water Reservoir for Euphonium. This plastic valve reservoir is suitable for most Euphoniums with "Besson" type. Our ball bearing technology allows lightning fast, smooth, and quiet operation. The pressure releases at half stroke with our venting system, which is only possible because of our precision machining. Old cornet of the Kiev factory 1980s USSR. Lamonte Trumpet - Schenkalaars Stencil made in Holland with Nice Original Case and Mouthpiece Bore. 458 Serial 90 . Dutch manufactured Trumpet in very good condition, detailed and ready. Holland is listed on the receiver. 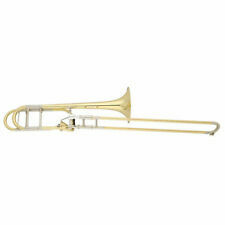 BerkeleyWind 3 Valves Trombone Bb and C perfect for Banda Music. Condition is New. Shipped with USPS Parcel Select Ground.